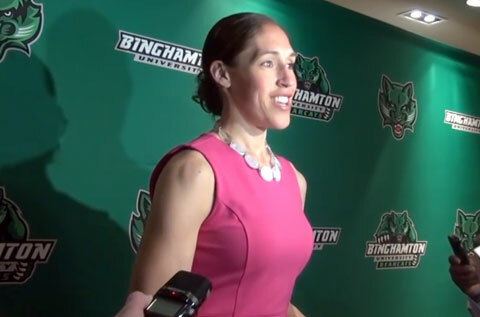 BINGHAMTON, NY — Former WNBA star and Olympic gold medalist, Rebecca Lobo was the keynote speaker on April 27, 2015 at the athletics department’s 10th-annual Binghamton University Collegiate Women’s Luncheon. Source: bupipedream.com. This year’s event drew a record-setting attendance with over 550 attendees. Since 2006, the luncheon has also raised over $250,000 for its Binghamton Bearcats Athletics Association Women’s Scholarship Fund, and awarded to two female student-athletes annually. Rebecca Lobo is an ESPN basketball analyst and former women’s basketball star in the Women’s National Basketball Association (WNBA) from 1997 to 2003. Lobo, at 6′ 4″, played the center position for much of her career. She played college basketball at the University of Connecticut, where she was a member of the team that won the 1995 national championship that went 35–0. Lobo is also a breast cancer advocate and health spokesperson. Playing Field Promotions is a booking agent for motivational sports speakers and celebrities. If you would like to book professional athletes like Rebecca Lobo for a speaking engagement, personal appearance or special event, you can request Rebecca Lobo’s agent and speaker information from PFP Sports & Celebrity Talent or call 800.966.1380.